We’d love your help. Let us know what’s wrong with this preview of Closed Casket by Sophie Hannah. "What I intend to say to you will come as a shock..."
With these words, Lady Athelinda Playford -- one of the world's most beloved children's authors -- springs a surprise on the lawyer entrusted with her will. As guests arrive for a party at her Irish mansion, Lady Playford has decided to cut off her two children without a penny . . . and leave her vast fortune to someone "What I intend to say to you will come as a shock..."
With these words, Lady Athelinda Playford -- one of the world's most beloved children's authors -- springs a surprise on the lawyer entrusted with her will. As guests arrive for a party at her Irish mansion, Lady Playford has decided to cut off her two children without a penny . . . and leave her vast fortune to someone else: an invalid who has only weeks to live. Among Lady Playford's visitors are two strangers: the famous Belgian detective Hercule Poirot, and Inspector Edward Catchpool of Scotland Yard. Neither knows why he has been invited -- until Poirot begins to wonder if Lady Playford expects a murder. But why does she seem so determined to provoke a killer? And why -- when the crime is committed despite Poirot's best efforts to stop it -- does the identity of the victim make no sense at all? To ask other readers questions about Closed Casket, please sign up. I was not a fan of The Monogram Murders. The murderer was apparent by page 200, characters were underdeveloped, Catchpool just seemed like an addition that was pointless as he does nothing but get information about the weird backstory--and the motive was forgettable, and it was too long. Is this one better in those respects as it is getting better reviews from fans than its predecessor? Will I like this one? This is the second book that Sophie Hannah has written with Poirot since she took up the Agatha Christie mantle. Whilst I had enjoyed Monogram Murders, this was a harder sell for me. The story is narrated by Inspector Edward Catchpool of Scotland Yard. For no reason that he can fathom, he has been invited to Clonakilty, County Cork in Ireland. He is to be a house guest at Lillieoak, a mansion owned by Lady Playford, a writer of the Shrimp series. He harbours some resentment of Poirot after the m This is the second book that Sophie Hannah has written with Poirot since she took up the Agatha Christie mantle. Whilst I had enjoyed Monogram Murders, this was a harder sell for me. The story is narrated by Inspector Edward Catchpool of Scotland Yard. For no reason that he can fathom, he has been invited to Clonakilty, County Cork in Ireland. He is to be a house guest at Lillieoak, a mansion owned by Lady Playford, a writer of the Shrimp series. He harbours some resentment of Poirot after the media coverage of his role in the Monogram Murders, but gets over this once he discovers Poirot is a guest. Lady Playford has summoned Michael Gathercole to change her will leaving everything to her dying assistant, Joseph Scotcher. She is disinheriting her son, Harry, an obsessed taxidermist and her daughter, Claudia, is engaged to be married to the extremely wealthy Dr Randall Kimpton. The scene is set for a murder in a country house which could only have been committed by a resident or guest. Lady Playford announces the change in her will to rancorous recriminations, bitterness and other drama. Scotcher makes clear his intention to marry his nurse, Sophie, despite his terminal illness. There are overheard conversations, a fear of being poisoned by the lawyer, Orville Rolfe, and an upset Lady Playford. Sophie discovers the dead body of Joseph Scotcher, and claims to witness Claudia killing him despite the fact that this seems unlikely. Poirot and Catchpool investigate all in the house and delve into the life of the victim. There are a number of red herrings along with an inept Irish policeman in charge of the case. Poirot has a trip to England which gives him much information and the killer is finally unveiled at the end. Dame Agatha is rolling in her grave. Closed Casket by Sophie Hannah/ Agatha Christie is a 2016 William Morrow publication. Lady Athelinda Playford gathers an eclectic group of people together when she decides to announce a major change to her will, a very controversial decision that could bring about terrible repercussions. Inspector Edward Catchpool and the incomparable Hercule Poirot, may have been invited due to Playford’s suspicions that murder is on someone’s mind. However, a murder is committed right under the famous Belgian Closed Casket by Sophie Hannah/ Agatha Christie is a 2016 William Morrow publication. Inspector Edward Catchpool and the incomparable Hercule Poirot, may have been invited due to Playford’s suspicions that murder is on someone’s mind. However, a murder is committed right under the famous Belgian detective’s nose, prompting him to give those little grey cells some mandatory overtime. This is the first Poirot mystery with Sophie Hannah writing as Agatha Christie that I’ve read. I must confess, the very idea of resurrecting one of my favorite detectives sounded like a marvelous idea… if we could resurrect Agatha along with him. I was very skeptical of how this would work out, although, I have seen other long running and well loved series taken over by ghost writers work out quite well. I have also seen them crash and burn. So, with an odd mix of excitement and trepidation, I decided to give this book a fair chance. Honestly, I enjoyed this mystery, if for no other reason than for the pleasure of reading the old tried and true whodunit format used in the golden age of detective novels. The characters are well drawn, the dialogue is impressive, and there are plenty of interesting details and psychology involved. While clever on many levels, it wasn’t too hard to guess who the culprit was, and Poirot is a not quite the same guy we’ve all come to know and love. He’s not as vivid, and his arrogance and fussiness is only evident in one or two places, which are traits I always adored about him and made me chuckle. Still, I thought the author did an admirable job considering the monumental shoes she had to fill. She makes Poirot her own and created a fun and easy mystery, while capturing the essence of a bygone era, and paying homage to it at the same time. Overall, I had a pretty good time with this one. It makes a nice diversion from the stresses of life, and I think cozy mystery lovers would find this one to their liking as well. This was quite a good attempt to continue Agatha Christie's legacy. It is a decent book and interesting reading. It can bring you into the world and psyche of Hercule Poirot. I would say it is a typican whodunit plot, intriguing with suspence. It carries the characteristics that we find in Poirot. By that, I mean that someone not knowing the famous Belgian detective would easily get the grab of him in this book. On the othe hand though, if this was my first Poirot mystery I wouldn't be so trigger This was quite a good attempt to continue Agatha Christie's legacy. It is a decent book and interesting reading. It can bring you into the world and psyche of Hercule Poirot. I would say it is a typican whodunit plot, intriguing with suspence. It carries the characteristics that we find in Poirot. By that, I mean that someone not knowing the famous Belgian detective would easily get the grab of him in this book. Hercule Poirot is back again with another new adventure and mystery in Sophie Hannah, an internationally bestselling writer's new book, Closed Casket where the Belgian detective Poirot along with the help of Scotland Yard inspector, Edward Catchpool, solve the mystery surrounding an old rich, aristocrat lady's lavish party at a forgotten Irish countryside where among the guests, there is a killer lurking around and they must try to stop him/her before he/she strikes his weapon to commit a crime. The world's most famous detective returns in this ingenious, stylish, and altogether delicious mystery from the author of the instant bestseller The Monogram Murders ("I was thrilled" -- Gillian Flynn). Poirot and Catchpool are among the list of guests attending Lady Athelinda Playford, the popular and bestselling children's detective series books' grand party at her mansion in Clonakilty, County Cork. The reason behind to throw this party is to tell her children as well as their spouses/partners about the sudden change of her old will which she has changed under her lawyer's presence and has left all her property and fortune to her dying and extremely sick secretary without any apparent reason and she is certain that someone might try to commit a crime, hence she has invited the two detective so that they can try to prevent it from happening. But still a murder happens despite the presence of the famous Hercule Poirot, so can Poirot identify the killer's face? There is also this twist from the guests' POV that they are not aware about the reason why they are actually invited to the party, no one have a clue about it, yet the readers are quite aware about it, so in someway, the story at this point, sounds like Agatha Christie's And Then There Were None. Well, Hannah's portrayal of this Poirot mystery is simply fantastic, although at times, the story dragged a bit with too much back story which sounds is bit irrelevant in the story. The plot is a complete pot-boiler with millions of twists and turns which will leave your brain more puzzled if you try to figure it out on your own, so guys, leave it to Poirot, he will guide you with his brilliance to the end of this complicated maze. Poirot's charm is unmatchable and the author has captured it quite vividly into her story just like she did in the previous book. This Poirot is, although, a more of an evolved version than Christie's, anyhow, the best part is that Poirot is back and he will continue to surprise as well as entertain and challenge the readers with his mysteries. So I suggest that Christie's Poirot fans must at least give this version of Poirot a chance to let him fly his wings of unbeatable wit to solve some gruesome crimes in England. The writing style of the author is quite crisp and emphatic although I'm not comparing her with Christie. Sophie has got some flair in her style of depicting this tale of mystery and also her narration is very articulate. The writing is laced with tension and suspense as the author pulls her readers into the depth of this baffling maze. The pacing is sometimes quite fast but at times, it dragged, but overall, its swift and the readers will easily sway with the story's flow. The mystery is unfolded diligently by the author as there are so many twists ans turns that will not only blind side the readers but will also keep the readers guessing and anticipating about the killer's identity until the very last page. The author's building of the plot is smart and clever as she gradually develops the characters with all their flaws and secrets that play an important role in the story line. The huge cast of characters that Sophie has created is tastefully spun and their depth is eventually unrolled with the progress of the plot. The character's backstory will help the readers to easily connect with them and also will help them to look through the characters. In a nutshell, this riveting crime thriller will constantly keep the readers on their edges, with its new twists and evolving story line and the unexpected challenges. So over a large cup of hot coffee, enjoy Poirot's thrilling adventure as he solves the crime with his trademark charm and cleverness. Verdict: Poirot is back with an exciting new and enthralling adventure, so don't miss to grab this book. Oui! Courtesy: Thanks to the author, Sophie Hannah's publicist from Harper Collins UK, for giving me the opportunity to read and review her book. Buying Closed Casket was the triumph of hope over experience. In 2014 author Sophie Hannah released The Monogram Murders, the first Hercule Poirot novel since Curtain: Poirot's Last Case: A Hercule Poirot Mystery was published in 1975. While not up to Dame Agatha Christie’s highest standards, Hannah’s novel wasn’t too shabby. So I bought Closed Casket hoping for better than a pleasant read and for something less convoluted and implausible than The Monogram Murders. Was my hope justified? Not a ch Buying Closed Casket was the triumph of hope over experience. In 2014 author Sophie Hannah released The Monogram Murders, the first Hercule Poirot novel since Curtain: Poirot's Last Case: A Hercule Poirot Mystery was published in 1975. While not up to Dame Agatha Christie’s highest standards, Hannah’s novel wasn’t too shabby. So I bought Closed Casket hoping for better than a pleasant read and for something less convoluted and implausible than The Monogram Murders. Was my hope justified? Not a chance. Just as Jill Paton Walsh can’t quite capture the voice of Dorothy L. Sayers, Hannah can’t really sound like Christie in the way that, say, Laurie R. King can channel Sir Arthur Conan Doyle. But I’ve never really held that against Hannah. However, Hannah seems to think that the way to recreate a successful Christie novel is to pepper a house party with lots of loathsome characters and then set Poirot and Scotland Yard detective Edward Catchpool (a transparent Captain Hastings surrogate) to bumble about. Early in the novel, a viciously rude character asks Poirot if he’s left his brain in London; soon I began to suspect the same thing. Hannah’s Poirot is much less astute and more needlessly secretive than the real one and, unlike Hastings, Edward Catchpool is paranoid and unlikable. Author Athelinda “Athie” Playford has made a great success with her series of children’s mysteries featuring a gang of 10-year-old sleuths led by her moppet heroine “Shrimp” Seddon. Lady Playford decides to disinherit her dimwitted son and her venomous, selfish daughter in favor of her Pollyannaish secretary, Joseph Scotcher, a man dying of kidney disease so advanced that he is confined to a wheelchair and attended full time by a nurse. All of the characters — saving Hercule Poirot and Dr. Randall Kimpton, the fiancé of Lady Playford’s daughter Claudia — are so cardboard that you could make cereal boxes out of them. Naturally, part of the mystery would be why a robust woman like Lady Playford would bother with changing her will in the autumn to benefit a man who won’t live to inherit; however, when the clever, imaginative Lady Playford reveals her reason, it makes no sense at all. In addition, Lady Playford, an obviously intelligent woman, seems shocked when her children aren’t happy with the new will. Damn! Why would they be? Closed Casket isn’t as lousy as The Big Four, Christie’s worst novel by far, but it’s a pretty pedestrian novel with a denouement that would seem contrived if I hadn’t been past caring by that point. What's better than Belgian chocolate? Obviously our Belgian detective and his grey cells. Incredibly happy that Poirot is back in literary world. This time, Hannah takes us to a country house- one of my favourite Agatha Christie settings. It's really devilish-ly clever this book, I didn't see the end coming at all. Can't wait for the next one in series!!! Started this book snuggled up with a cup of tea by my side and smile on my face for a 'new' Poirot adventure to begin. What a MAJOR disappointment it was. Her narrator, Catchpool, seemed to be her 'Hastings' but was to also be a capable police detective with a promising career. Obviously this didn't work - love Hastings but lovable bumbling is more his mode than sharp detective skills - and this character did not work. Actually all of the characters seemed to be only l characteristics than any full blown personalities. And Poirot, one of the best known characters of mystery novels, there were only glimpses of him in the character she had portrayed. Plot was obvious as to who would die but didn't grip you at all. Had a hard time getting through this book and not worth while at all. No Idea why anyone would give more than 2 stars. Poirot in 1929 - the heyday, nee the Golden Age of murder and Christie. Ths was great. Lots of fun if a bit brutal and not as adoring to Hercule as Christie would have made it. She still liked him in the early days. Agatha Christie is my favorite yesteryear cozy mystery author. Sophie Hannah is one of my favorite current psychological mystery authors. So when Sophie Hannah started giving a new life to Hercule Poirot, I was excited. Monogram murders, the first of this revamped Poirot series was well appreciated by me, though many found it lacking. Closed Casket was in my radar, the day I saw it on GR, and when I received it as a gift, I was over the moon. This seems like an amalgam of Christie and Hannah, but Agatha Christie is my favorite yesteryear cozy mystery author. Sophie Hannah is one of my favorite current psychological mystery authors. So when Sophie Hannah started giving a new life to Hercule Poirot, I was excited. This seems like an amalgam of Christie and Hannah, but somehow when Hannah tried to imitate Christie style in conjuring up a new Poirot, something went wrong somewhere. The newer Poirot seems like a brother of the original Poirot. If I were blinded to the author, still I would have easily guessed that it is not Dame Christie who has written it. This Poirot acts and talks different, doesnot groom his moustache, doesnot mention his grey cells, and doesn't blunder about with the English language like the older one. This one is more suave, more Sherlockish. And I feel a certain amount of distance from him. Hastings is never to be seen. Instead it is Michael Catchpool who acts as a lackey. Catchpool is cute in his own way. And I am thankful that Hannah replaced Hastings with Catchpool, because if Hastings too came in a different avtar, I would have been disconcerted. The mystery too is more sophisticated with the characters being more obtuse and conniving than the almost straight forward Christie characters. Athea Playford, the eccentric rich, mystery novelist of County Cork mansion in Ireland invites Poirot and Catchpool, along with her lawyers, and announces a nasty surprise - that she has changed her existing will, the beneficiaries of which were her daughter and son, to a new one which endows all her property to her ailing, about to die secretary, Joseph Scotcher. This sets forth a chain reaction, with a fatality that Poirot cannot prevent. Finding out who the murderer is occupies great deal of time and effort, with many vicious secrets coming out. No one seems to be who they purport to be. 1. Like "Clue", all of the suspects staying in the same house and sorting out who was where during the murder; I halfway expected to read about Colonel Mustard and a pipe wrench. Sophie Hannah must have had great fun writing this new Poirot mystery. The immaculate Belgian detective is drawn impeccably, surrounded by an outrageous cast of mostly unpleasant people in a wildly improbable version of the English country house murder. It was an entertaining, stylish, escapist read, 3.5 rather than a flat 3. I was a bit startled to see that copyright rests with Agatha Christie Limited, and hope Hannah's contract pays her well for what should be a successful book. Clearly the com Sophie Hannah must have had great fun writing this new Poirot mystery. The immaculate Belgian detective is drawn impeccably, surrounded by an outrageous cast of mostly unpleasant people in a wildly improbable version of the English country house murder. Sophie Hannah has risen to the challenge to become the voice and mind of Hercule Poirot and mimic everything that the Grand Dame of Crime Fiction created. Hannah has picked up where Agatha Christie left off and it is impossible to notice that Poirot came to life over 100 years before, this is a seamless addition to the Christie canon. Hercule Poirot has been invited over to the newly independent Ireland, as the guest of aristocratic author Lady Playford to her country estate of Lillieoak. We are told the story of Closed Casket, through the eyes and voice of Inspector Edward Catchpole of Scotland Yard, a friend and colleague of Poirot’s. It is October 1929, and both Poirot and Catchpole wonder why they have both been invited to stay as guests. Everything becomes clear over the first night why they are both house guests, when Lady Playford’s secretary, Joseph Scotcher, after dinner is found murdered. So begins the classic Christie, Manor House style mystery. Throughout the book we get to know all the characters a lot more and some of their thoughts that they have not told each other. Poirot who has his ‘grey cells’ thinking is intrigued by what has gone on, and investigates further, to the annoyance of the Irish Police Inspector sent to investigate the murder. Even at the Coroner’s Inquest Poirot recognises that everything that they have been told and what has been said in court is not necessarily the truth. The suspects all have their own quirks and secrets that they do not want to come out, as did the murder victim. Like Christie, Hannah does not delve too deeply in to the characters, but is consumed by the whole even of murder in a Country House. 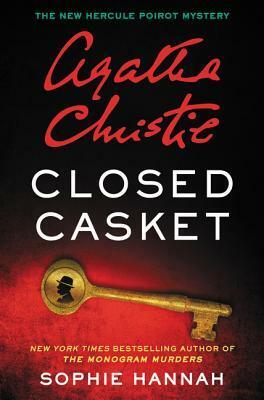 In parts of Closed Casket you can be forgiven if you feel that Christie could have written those passages, but that is the art of an excellent author, who has studied her subjects of Poirot and Christie. It would be easy to point out the things Christie did make Poirot do, but Hannah does, but clearly different people bring their own quirks to the story. Closed Casket does not disappoint, and I am sure Christie herself would have been delighted with this story if she had written it. For fans of Poirot all his nuances are there, from his gate, his OCD, and how he expresses himself in Franco-English. Sophie Hannah has written Closed Casket so well, that Poirot is just as he was when Christie wrote her last, this is a seamless continuation. An excellent book that fans of Poirot and Christie will love and take to heart. So I read an article recently about why, the estates of famous writers, tend to suddenly allow a "new" book to come out so many years after the originals. It's all about copyright. See, the copyright on some of Christie's earlier books are soon to expire. However, if they commission a new book, they can retain the copyright to the characters. I have very mixed feelings about this, especially when I think about all the awesome things that wouldn't exist if the copyright hadn't expired. Like Sherl So I read an article recently about why, the estates of famous writers, tend to suddenly allow a "new" book to come out so many years after the originals. It's all about copyright. See, the copyright on some of Christie's earlier books are soon to expire. However, if they commission a new book, they can retain the copyright to the characters. I have very mixed feelings about this, especially when I think about all the awesome things that wouldn't exist if the copyright hadn't expired. Like Sherlock. I received "Closed Casket" through a Goodreads Giveaway and am now meeting my responsibility to write a review. Author Sophie Hannah clearly idolizes the great Agatha Christie; in fact, she has an index in the book that lists all of Christie's books and plays. She clearly intends to honor Christie in this novel. She brings life to Hercule Poirot in the story, and does him justice. I always pictured Poirot in this book as the one played by David Suchet on PBS Mystery. However, Hannah uses another c I received "Closed Casket" through a Goodreads Giveaway and am now meeting my responsibility to write a review. However, Hannah uses another character as the narrator--Edward Catchpool, a detective with Scotland Yard in London. He and Poirot are friends and have worked on cases together. Catchpool and Poirot are invited to Lillieoak the manor home of Lady Athelinda Playford in Clonakilty, County Cork, the Irish Free State. The year is 1929. Lady Athelinda "Athie" is a novelist of mystery stories for children. Her protagonist is Shrimp Sedden, and Athie has made a fortune from these mysteries. Also staying in the house are Athie's children Harry, Viscount of Playford and his wife Dorothy "Dorro" and Claudia Playford and her fiancée Dr. Randall Kimpton; Athie's attorneys Orville Rolfe and Michael Gathercole; Athie's secretary Joseph Scotcher and his nurse Sophie Bourlet; and the staff, Butler Hatton, Cook Brigid, and Housemaid Phyllis. Out of that group is a murderer and a murder victim. It is up to Poirot and Catchpool to uncover the killer. Poirot describes it as an elegant and logical murder. Of course, the local Garda Siochana, Sergeant Daniel O'Dwyer and Inspector Arthur Conree often are impediments to Poirot and Catchpool. Είχα αρχίσει να πιστεύω πως δε θα τελείωνε ποτέ....και τώρα που ευτυχώς τελείωσε ορκίζομαι να ειπώ την αλήθεια και μόνο την αλήθεια χωρίς φόβο και πάθος!!! Για το θεό! !Πόσο τραγικό βιβλίο?? ?Ήταν τόσο μα τόσο βαρετό που ακόμα κι αν δε κατάφερα να ανακαλύψω τη λύση του μυστηρίου(η οποία ήταν μια μ.... και μισή), δε με ένοιαζε να τη μάθω.Πως το κατάφερε αυτό αναρωτιέμαι ακόμα...Και θα μου πεις γιατί δε το παρατούσες? ΕΛΑ ΜΟΥ ΝΤΕ!ΨΥΧΑΝΑΓΚΑΣΜΟΣ. Καταρχάς την υπόθεση εξιστορεί ο Έντουαρντ Κάτσπουλ που ε Είχα αρχίσει να πιστεύω πως δε θα τελείωνε ποτέ....και τώρα που ευτυχώς τελείωσε ορκίζομαι να ειπώ την αλήθεια και μόνο την αλήθεια χωρίς φόβο και πάθος!!! I need to confess that I had no idea Sophie Hannah had revitalised Agatha Christie’s famous Belgian detective and his little grey cells until this book appeared on a listing. It was only then I discovered Hannah had previously released The Monogram Murders, featuring Hercule Poirot, in 2014 – almost 40 years after the passing of Dame Agatha. I should mention here that I adore Agatha Christie. I’ve read all of her books a million times. At least. Lovers of the original will notice there are some s I need to confess that I had no idea Sophie Hannah had revitalised Agatha Christie’s famous Belgian detective and his little grey cells until this book appeared on a listing. It was only then I discovered Hannah had previously released The Monogram Murders, featuring Hercule Poirot, in 2014 – almost 40 years after the passing of Dame Agatha. Lovers of the original will notice there are some significant differences between Christie’s Poirot and Hannah’s Poirot. Hannah’s books are far longer for a start. And Poirot – for me – was a little less impressive. Though less arrogant, he was also less larger-than-life (if that makes sense). Our narrator this time around was the off-duty Inspector Catchpool and it felt weird to be privy to Poirot’s investigations through someone else’s eyes. I wasn’t actually a Hastings devotee but realised I missed their witty banter. Hannah obviously also featured Catchpool in The Monogram Murders as he was still smarting from being bested by Poirot on that outing. The cast of characters themselves were far more distasteful than I remember Christie’s being. Hers were often eccentric and unlikeable, but not necessarily evil. The crime itself and references to it were also far more vivid and gory than the original series… but I assume some of that relates to the fact that we’ve become inured to ‘simple’ deaths in our reading, television and big screen fodder. There were also a lot of positives. Hannah did mostly keep to the style of Christie: in her overly-wordy language and prose. The mystery itself was suitably twisty; and investigation offered up a myriad of suspects. So this was an enjoyable outing with my old friend and his little grey cells. His star shone a little less bright than it once did, but I most-certainly welcome his return. Given that I have no memory of anything from The Monogram Murders, I can't make any comparisons to it. Besides that it didn't really feel like a Poirot mystery. Since I don't even remember the murder, I can't tell you why. That's just how it felt to me. However, I can honestly say, this felt like a genuine Poirot mystery. I could hear his voice in my head. I could see the mystery exactly. It just felt authentic to me, and, when you're writing any sort of pastiche, that's key. You have to capture Given that I have no memory of anything from The Monogram Murders, I can't make any comparisons to it. Besides that it didn't really feel like a Poirot mystery. Since I don't even remember the murder, I can't tell you why. That's just how it felt to me. However, I can honestly say, this felt like a genuine Poirot mystery. I could hear his voice in my head. I could see the mystery exactly. It just felt authentic to me, and, when you're writing any sort of pastiche, that's key. You have to capture the key people, the era, and the tone. In the case with mysteries, you have to capture the specific sort of mystery. If it's a cozy mystery, you can't just go and make it some crazy violent story. You have to stick with it, or you're going to lose people. Sophie Hannah bukanlah Agatha Christie. Jadi tentunya pasti ada perbedaan gaya tulisan di antara mereka. Karena itu saya tidak berharap terlalu tinggi dan meminta banyak bahwa buku ini akan sama persis seperti tulisan Agatha Christie. Sempat sedikit kecewa dengan The Monogram Murders. Tapi saya senang karena buku ini lebih baik dari The Monogram Murders. Poirot lebih seperti Poirot di buku ini. Dan saya tidak kesulitan membaca narasinya seperti yang saya rasakan pada bab-bab awal The Monogram Mu Sophie Hannah bukanlah Agatha Christie. Jadi tentunya pasti ada perbedaan gaya tulisan di antara mereka. Karena itu saya tidak berharap terlalu tinggi dan meminta banyak bahwa buku ini akan sama persis seperti tulisan Agatha Christie. Sempat sedikit kecewa dengan The Monogram Murders. Tapi saya senang karena buku ini lebih baik dari The Monogram Murders. Poirot lebih seperti Poirot di buku ini. Dan saya tidak kesulitan membaca narasinya seperti yang saya rasakan pada bab-bab awal The Monogram Murders. Dan satu hal yang saya sangat suka adalah Edward Catchpool. Saya sangat suka karakternya dan terlihat jelas pengembangan karakternya di buku ini. Ενα πολυ ευχαριστο βιβλιο με πολυ γρηγορο ρυθμο και ωραιες περιγραφες! Το μονο αρνητικο ειναι οτι παρα το γεγονος οτι το μυστηριο του φονου εξηγειται επαρκεστατα , τα κινητρα και τα αιτια που οδηγησαν τον/την δολοφονο στο εγκλημα δεν μου φανηκαν ιδιαιτερα αληθοφανη! Το προτεινω ομως ανεπιφυλακτα σε οσους θελουν να διαβασουν μια καινουρια ιστορια του αγαπημενου μας Βελγου ντεντεκτιβ! Surly better than the "monogram" but in the exact same way flat and pointless! The first half is well developed but then again to create a mystery is easier than to give satisfying answers to it! Love a good whodunnit with Poirot. A fun listen and great story. I really should go back and read some of the older Christie books....one day!! ...but my fab brother bought it for me for Christmas knowing I love Poirot and probably didn't realise it was written by somebody else (check out the cover!). I liked it - the story was a bit odd and a little stilted in places but I still enjoyed the mystery and the rambunctious and frankly rude characters were amusing. Poirot was not quite himself! But it didn't spoil the book for me and I flew through it to find a good solid ending. Not as bad as the first book - I think Sophie Hannah has already had some better grasps on how to write a Poirot story. True, there are some parts that are still meh and so unPoirot. Also, the way the mystery unraveled is also still a bit stiff, not flowing smoothly in my opinion. And I don't understand why Hannah still insisted on using Catchpool as her narrator - he is definitely a weaker version of Hastings haha. I wish she could just write the story in a third person point of view, with Poir Not as bad as the first book - I think Sophie Hannah has already had some better grasps on how to write a Poirot story. True, there are some parts that are still meh and so unPoirot. Also, the way the mystery unraveled is also still a bit stiff, not flowing smoothly in my opinion. And I don't understand why Hannah still insisted on using Catchpool as her narrator - he is definitely a weaker version of Hastings haha. I wish she could just write the story in a third person point of view, with Poirot's monologues at the end of the book, very classic and acceptable. More like 4,3 or something, to be honest. I can't give it a solid 5 because the ending wasn't all that shocking, you could have guessed it were you alert enough. However, a 4 is also unjust because I had such a great time reading this book! I enjoyed the characters and the whole atmosphere immensely! I really did feel like I was inside a good old Poirot novel and it was exhilarating! I can't wait to get my hands on the next one and I'm really very grateful to Sophie Hannah for this experience. אגתה כריסטי יש רק אחת. Sophie Hannah is an internationally bestselling writer of psychological crime fiction, published in 27 countries. In 2013, her latest novel, The Carrier, won the Crime Thriller of the Year Award at the Specsavers National Book Awards. Two of Sophie’s crime novels, The Point of Rescue and The Other Half Lives, have been adapted for television and appeared on ITV1 under the series title Case Sensiti Sophie Hannah is an internationally bestselling writer of psychological crime fiction, published in 27 countries. In 2013, her latest novel, The Carrier, won the Crime Thriller of the Year Award at the Specsavers National Book Awards. Two of Sophie’s crime novels, The Point of Rescue and The Other Half Lives, have been adapted for television and appeared on ITV1 under the series title Case Sensitive in 2011 and 2012. In 2004, Sophie won first prize in the Daphne Du Maurier Festival Short Story Competition for her suspense story The Octopus Nest, which is now published in her first collection of short stories, The Fantastic Book of Everybody’s Secrets.